Anime is hand drawn. By people, with their hands. That’s honestly all there is to this enduring myth, which is somehow alive on both sides of the pond. I’m used to western fans spouting the classic I miss when anime was hand drawn rhetoric, but it got to me last week when I saw Japanese press report Ghibli successor Studio Ponoc as a source of traditional hand drawn animation in an age of digital anime…even though their country has hundreds of 2D animation companies, with new ones being founded on a yearly basis. If you’re a regular reader of this site, you’re likely already aware of most things I’m about to talk about, though perhaps you don’t know the exact minutia. But even if you are aware of all of it, this should be an accessible resource if you ever find yourself in an argument about the nature of anime. I miss the times when anime was hand drawn. You don’t, because it’s physically impossible to – as in, it still is hand drawn. That’s the whole point of the article, but I don’t want to spend too much time on this basic idea. Around 3% of new full length TV anime in 2016 were 3DCG productions, which means that the percentage of 3D anime being broadcast is even smaller, as that doesn’t account for the traditional long running series. Actual 2D-3D co-productions aren’t much more common, though if you start to include 2D series with a major recurring 3D component you can get to around 10-20% of the new output. Boundaries here are less precise, but it’s clear either way that they’re in the minority. CG anime is no doubt on the rise, but their presence is greatly exaggerated; those projects are perceived as an anomaly and thus receive more attention by default, whereas dozens upon dozens of traditionally crafted anime are simply forgotten every year. There is in fact way too much hand drawn anime, but that’s a discussion for another time. It’s all done with computers now though! Yes and no. Cel animation was gradually phased out during the late 90s and early 00s, and by 2007 the only fully traditional TV anime remaining was Sazae-san; the endless series managed to extend yet another of its records until 2013, but eventually even they moved to a partly digital workflow. What does that mean? Animation is drawn as it used to be, then gets scanned so that painting and assembling of all elements is done on a computer. Things have started to change with the advent of digital animation: you can now trace the key animation and draw digital in-betweens, or start off drawing the former on tablets to begin with. Even entirely digital projects are possible nowadays, though they still require specialized crews and limited workloads, as seen on this season’s Aku no Gundan experiment at Tatsunoko (and even that had some traditional outsourced weeks, despite being 2 minutes anime!). In this site we often find ourselves talking about digital animation, simply because the new waves of artists hitting the industry carry many fascinating animators who draw on tablets. 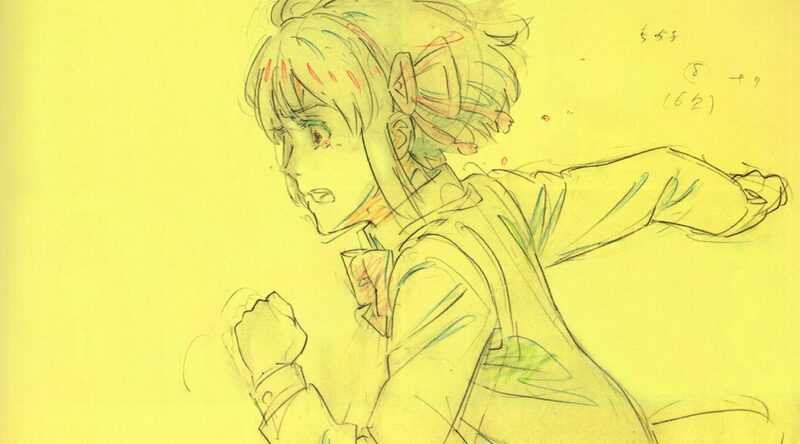 When it comes down to it though, most animation is still drawn on paper. A massively huge chunk of it is still crafted in the most traditional way possible, which only makes the misconceptions about the production of anime sound even more alien. And while we’re at it, I’ll spare you the debate over whether digital animation counts as hand drawn or not; unless you’re some sort of prodigy who has found other ways to operate tablets, you still use your hands to draw on them. There are terms that are up for debate, but this is hand drawn animation by its very definition. 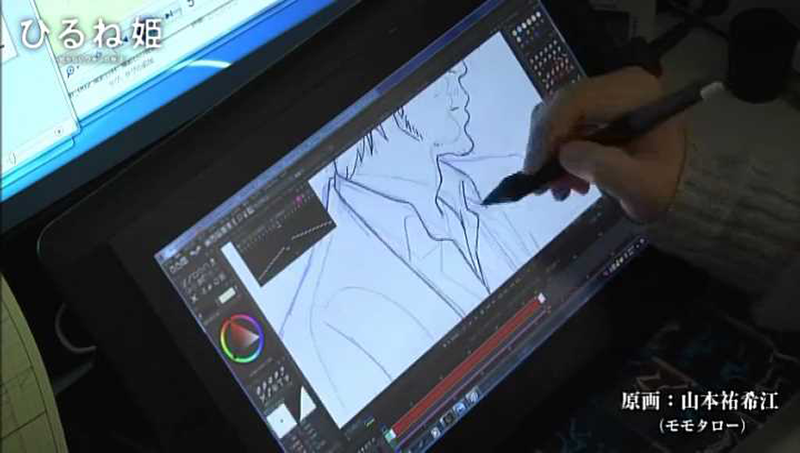 Yukie Yamamoto animating digitally for Hirune Hime. If this doesn’t look hand drawn to you, you might want to check what hands are. But I miss the way older anime looked. That you might, and it’s perfectly fair. There’s no denying that prevalent aesthetics have changed a lot. Not only do design sensibilities evolve, there’s also a clear impact the methodology has had on the output. The industry and individual creators themselves embraced digital production because it was highly preferable, and anyone denying that is simply out of their mind…but that doesn’t mean all changes were positive. The early days were plagued with color design disasters, plus all the SD projects have been a nightmare to revisit years down the line. We’ve gotten over the purely technical deficiencies and designers have adapted to those tools (though I would argue that color work in TV anime is still very poor), so currently the issues are more related to the increasingly adventurous post-processing attempts – at their worst, those can really get out of (go)hand. Negatives aside though, it’s true that anime’s repertoire has widened. Plenty of new techniques are now available to creators, while theoretically everything that was doable before is still possible. And I say in theory simply because virtually no one attempts to do it, but Shirobako made it obvious that it’s feasible. Even their less-than-ideal composite team put together footage that felt believably old-school, down to the limitations of the animation. It’s not a perfect replica, but you have to keep in mind that some cel quirks were unintended consequences of the craft, so this modern mimicry is more of an idealization of cel anime. Does that mean you’re wrong by preferring old-school looks? Of course not, whether it is due to the design tendencies or the more ethereal cel feel. You can easily call the current production model better, but that shouldn’t determine how much you personally like the output. There’s something undoubtedly charming to be found in cel animation errors that doesn’t really translate to digital craft, and that might be more important than you realize. It’s the set of tiny imperfections that keeps drawing us to 2D animation over the perfect form of 3D models, which somehow makes hand drawn background animation inherently much cooler than formally perfect moving 3D environments. Fans who grew up with cel anime in particular are prone to be used to those and find modern projects more artificial and plastic-y, just like how 2D animation fans in general feel about CGi aesthetics. Well, the issue is that nowadays it’s too easy to make anime with computers. I wish this was a bizarre strawman, but it’s a worryingly prevalent attitude. If you think that pieces of entertainment have to be crafted through blood, sweat, and tears to be worthwhile, you have issues a lighthearted article about how cartoons are manufactured can’t address. And the rotten cherry on top of that shitcake is that you’re, well, wrong. Anime production still entails a lot of work and stress, more than is reasonable. Digitalization has enabled mass production on new levels, first by removing the bottleneck that was cel painting and nowadays by researching efficient and even partly automated digital workflows. And yet it remains a tremendous amount of work, made immensely worse by the surrounding circumstances. So don’t worry, anime has unfortunately not become easy to produce. I can see the automated in-betweening used as a rough draft that is then corrected by a human. If it ever becomes perfect, I would like to say that an executive would value the training that in-betweening gives over the money they can save through automation, but I cannot. These are the same executives that use their wealth to put out more anime rather than pay a better wage. Those who say that making Anime today is easy should shut up. Really ought to leave out the ‘ANIME CRAFT WEEKLY #41’ or put it at the end of the title, so it makes articles like this easier to share. I almost posted this as a standalone article because of that, but I feel like I keep stealing content from this column. Point taken though! I thought it would be a pretty calm post! Turns out I had Opinions about certain mentalities though, ooops. I know that the animation company behind a few advertisements; most notably the McDonald’s one works with digital animation. That company is one of the very few who do digital illustration/animation. The workers of that company even get a salary. I am sure you already know this. Do you think there should be a shift to work being down digitally? In terms of productivity. This was most glorious form of gibberish I have had the privilege of reading. Thank you friend.